I am posting this recipe out here with a dual purpose.. First of all , this recipe for Vegetable Biryani goes to my perfect recipe list and secondly I love to share it with YOU. We had a second birthday celebration for my boyz with my remaining guests this weekend.. 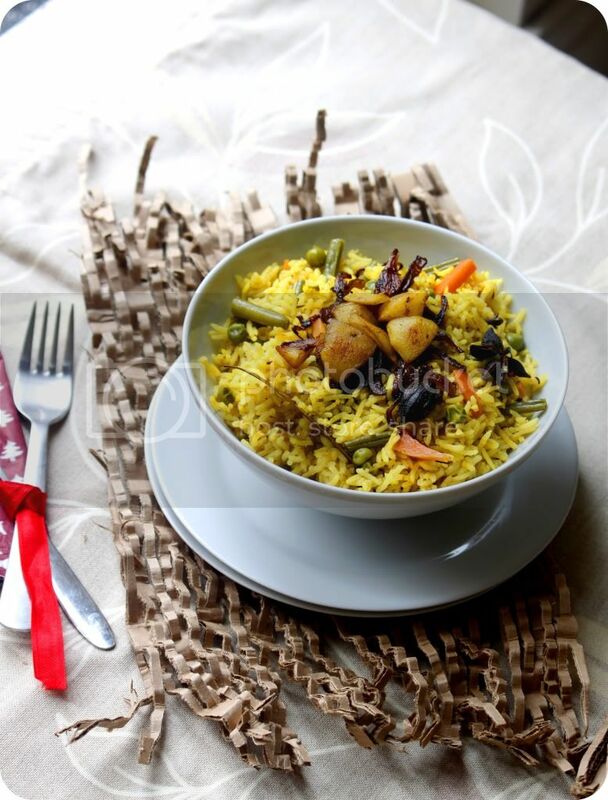 Vegetable Biryani was the main rice dish and I paired it with Boondi Onion Raitha,Aloo Gobi .. There were more dishes on the card – Mixed Veg Salad on the Starter Section.Aloo Gobi ( shhh coming up v soon in posts to follow) , Paneer mutter to go with Garlic Coriander Nan ( with love from the M& S store) . Also made my perfect Chocolate Cake !!! Wash Rice under running tap water and keep it aside. In the mean while , lets get the veggies ready . I chose Carrot , Beans and Peas to my job. Chop the Carrots n Beans about 3/4th inch in length . Heat oil + butter mix in a Non stick Pan. I have used half butter and half oil .. U could substitute butter with ghee too … Once heated , pop in the whole garam masala’s. Fry them for 1-2 minutes until done .Pop in Ginger Garlic paste & saute for 1 whole minute to eliminate raw smell. Now add the washed rice followed by the addition of turmeric & red chilli powder. Fry them in this buttery – masala mix for roughly 4-5 minutes. Remember not to over stir else the rice can break. At this stage , add in the veggies , chopped green chillies ,biryani masala & 2 glasses of water. Sprinkle half the salt and give it a good stir.. Cook in medium – high until the water nearly evaporates .. Reduce the flame to sim , squeeze a tsp of lemon juice , remaining salt & cover the pan with lid and cook for 4- 5 minutes. Turn off the gas and let the rice be covered for another few minutes. Simultaneously , generously add oil in another pan. Once heated , fry the onions until it turns brown and a bit crsipy. Drain them to a kitchen towel to soak all the excess oil. Half boil the chopped potatoes and fry them in the same pan as the onions.. Sprinkle some turmeric , chilli powder and salt over the potatoes and fry them until a light brown coating is formed all over. To garnish , sprinkle the fried onions and fried potatoes over the rice . Pan fried cashews could also be added . Its optional though. Serve them with raitha of your choice or with boondi raitha like I did.. They paired very well . 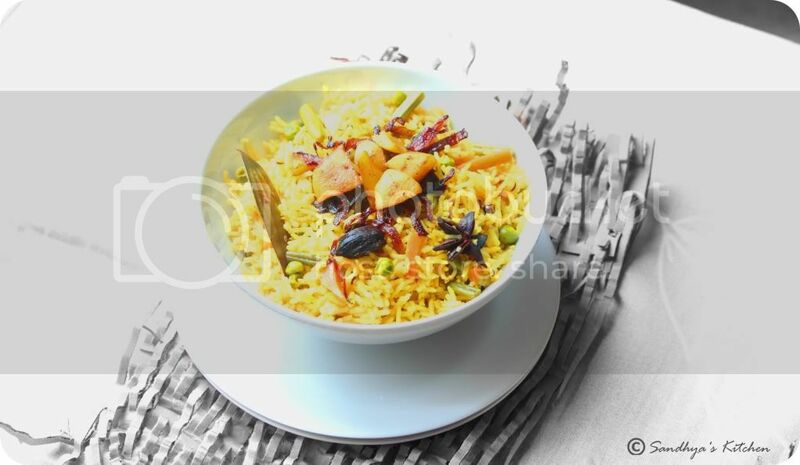 Since I had prepared the vegetable biryani early in the morning and the guests were to arrive for lunch , I had transferred the rice to an oven safe dish and warmed it at 200 C with a foil covered over the rice for about 15 minutes.. until just perfectly hot.. I would not recommend reheating in microwave.. It leaves a bit of a moist texture to the rice. Heyy thanks Satya… A sooper quicky comment!!! Awesome presentation…n the biryani look so yummy! Gorgeous and yummy biryani, simply delicious.wonderful clicks dear!!!! … Trying to get regular and catch up with most ppl …gradually. My Chocolate Cake is sure to follow in my posts!! I totally adore that recipe!! I fell in love with ur shot and biriyani when i saw this in FB..looks great. such beautiful flavors .. i can almost taste it ! Wow…that looks yummy and flavourful.Love the way u have presented…looks inviting. what a yummy looking biryani sandhya.. bookmarking. beautifully presented flavoursome and aromatic biriyani Sandhya. beautiful presentation….briyani looks perfect n delicious! looks delicious…esp in this weather it would be such a saving grace..hot biryani! 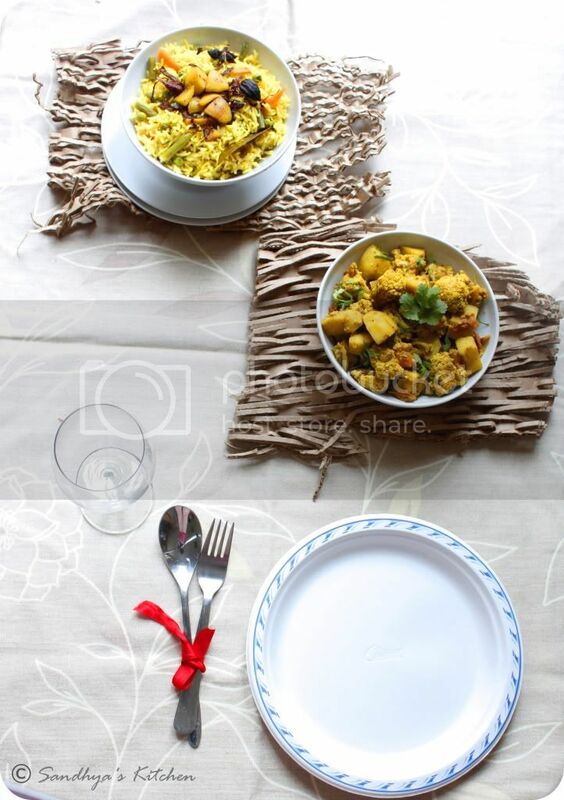 lovely looking rice- nice clicks !! superb briyani… can smell the flavor…. Delicious and aromatic biryani,wonderful presentation. You have been soo good in your space.. I have grown seeing your space too!! Jeyashri : Adding Lemon Juice helps us in separating the grains…do try it n see.. Thank you Ladies… Your comments mean a lot to me.. It makes me want to do better..
@ Prathima… It sure was a feast dear.. Afterall my boyz bday celebration again !! I love rice preps loaded with veggies and this biriyani is no different.. The biryani and the presentation is very nice. HI, this is my first time here. i loved all the pictures. they are super nice. the food loks yummy :)! Love the strip coasters! And of course the biryani! And all the light in the pictures…makes it terribly beautiful! Yummy. It is making me hungry.. Delicious and very tempting biryani !!! Love the color of the biryani! Very tempting..
first time i prepared biryani by following your receipe, its yummy my all family loved it. Flavorful biriyani!!! 🙂 The colors r beautiful! I tried this recipie last week and it came out very well. Everyone loved it. Thanks a lot. You have such a beautiful space, love your photography and write ups. Vegetable biryani looks fabulous! I used this recipe many years ago. I lost your link and was hunting through Google images because I loved your presentation and the picture stuck with me. Finally found my bookmark and here I am, gleefully cooking..